EDIT: removed the old pics, look for my most recent reply for new stuff. I've been prototyping and playing my game and I decided to sit down this weekend out hammer out the look for something and this is where I ended up for a travel card. The way it works is, when you draw your first card you use the entering text at the top, and the arrow indicates what to look for on the next card, in this example Explore Space, so if the next card drawn says Exploring Space, then you would do that event, otherwise you would do the Other event. From the mechanics/utilitarian point of view I quite like how you have your text and symbols set out. It's certainly easy enough to follow. However, and I realize I may be alone in this, I really don't like the semi-transparent background. My eyes find it a bit too busy while concentrating on the text. The border is fine but I'd lose the transparency where the text is displayed; I'd probably also lose the "paper" texture where the text is as well and go with a flat color -- probably off-white or light grey. As far as I'm concerned readability should always trump appearance when talking about anything that is primarily meant for imparting information. Edit: Also "persued" should be "pursued". The serif font in the description text is very "bouncy" at card size I would find it very hard to read. If you look at the baseline little A and little O are higher than the bottom of most other letters as examples. The weight of the font also is a little heavy on that background. The symbols are sharp and very effective. Without knowing the game, it feels like you have the right balance of words for descriptions, i.e. not overworded or hard to understand. I think the colored symbols could benefit from a think, black outline; they blend in too much with the background for my taste. I try to avoid fonts the look like Times New Roman, or Arial since they're common defaults in MS Word and I don't people to think my stuff is common, or free. The numbers are too narrow. I hope this doesn't sound like an attack; any opinion about something cosmetic like this always sound superficial to me. Put the star field on the back of the card, if you like the looks of it, and focus on visual contrast on the side on display, above. Decorative fonts often make reading text more problematic. You can limit this by using decorative fonts for the larger text instances, and for the bulk of the text, use a standard font that's easy on the eyes. When making your card roughly 2.5 x 3 inches big I had trouble reading the text. Is it necessary to have all 3 options on one card? Next to problems with readability it seems quite imposing to me. I took a few to do some updates, more contrast with the background, new font choice, put shadows on all the colored iconography, and made all icons same height so they look more consistent. Updated image in the OP. I should also add that this is a bridge card per TGC, 2.25" x 3.5" finished size. I liked the first pass icons. I liked the first pass icons. The border has sucked down the sense of dimension to them. I do a light lower right shadow at most. This font is still heavy for what amounts to about a seven point font. The lower contrast background works. And I really like the sense of gameplay with your cards connecting to what action to take on the card. I updated the OP with another card type I've played around with this week. Let me know what you think. 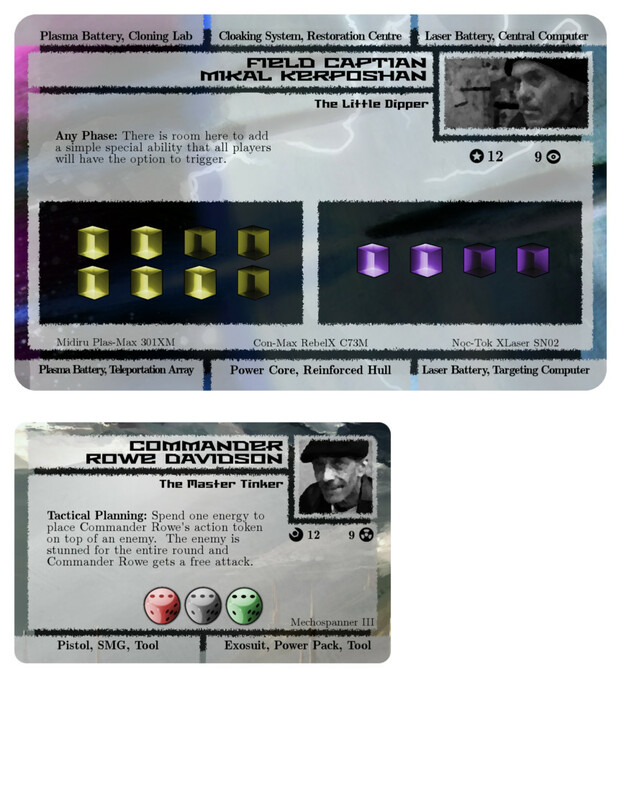 Crew cards have a title, 2 skill values, base dice, two equipment slots with item type restrictions, a starting item, and a special ability allowing you to spend a resource to activate. Players will have three of these in their play area. ...The way it works is, when you draw your first card you use the entering text at the top, and the arrow indicates what to look for on the next card, in this example Explore Space, so if the next card drawn says Exploring Space, then you would do that event, otherwise you would do the Other event. This is just an *idea* - but instead of "using the entered text at the top" for the FIRST card, you could select one of three ACTIONS. Each action would have a different *philosophy*. The idea is BEFORE a player DRAWS a card, he chooses which action he will perform. So instead of having cards that are interdependent, you would have actions and let the players choose to follow which action they would like on their turn. I think it would simplify the design of cards greatly. This is just my thoughts! Note: I think your general idea about linking to another card is *interesting*. I could allow you to do some STORYTELLING while playing your game. But I think you should allow player to CHOOSE their actions rather than refer to the next card... It's fundamentally the same (you still follow elements on the cards), its just that you choose which ones to follow BEFORE you know what is going to happen next. After all the responses I've gotten on the travel card I've decided to go back to it and try again, and I think I will try to incorporate some of your suggestions. Definitely more player choice should be involved in the travel phase. EDIT: Let me say thank you to all those that have posted this far, I really do appreciate all comments. I decided to rework the mechanics of the travel card, and cut out alot of the fancy icons and focus on the text as that is what I really want to do with this game. Nothing to show on that right now though, but I did work on another new card type this week and tweak my previous crew card to match the new card. Also scaled this down a bit, so maybe it will be a little more like actual size, cant make it exact since everyone is running different resolutions with different setups, etc. 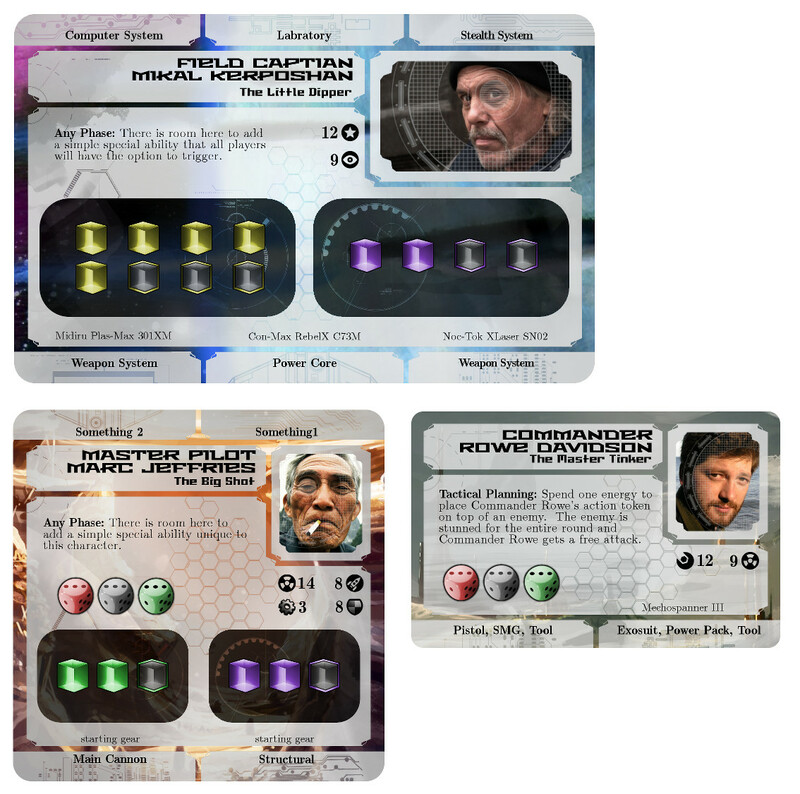 The captain card is a jumbo 3.5x5.5 and serves as a common resource pool for all players. There are six attachment slots, each slot having two type keywords. I may revisit the keyword choices as I had to tweak the font and letter spacing to make it work out. The bright cube icons indicate a starting value, and the darkened cubes indicate a maximum limit. There are now three fonts in use, one for the name, the second for the flavor descriptor under the name, and the third for everything else. I know alot of suggestions are for picking a more scifi font, but there will be alot of text in this game and I feel I should use a serif font as it will be easier to read in the long run. Sat down and redid the basic design to be more scifi themed. And did the last character card type while I was at it.